Sonoma County — AKA Sonoma Wine Country — boasts seventeen wine regions as is clear when you look at Sonoma winery maps. It's surprising how many combinations of varying climate and different soil conditions exist in this relatively small area. Of course, those differences are just what make each region's wines unique. Some of these wine regions (AKA appellations) have been declared for decades — Sonoma Valley, Dry Creek Valley, Alexander Valley — while others are only a few years old, like Fountaingrove (2015) and Moon Mountain (2013). Each regions supports specific grapes and has fostered unique winemakers. Lets take a look at some of these on a Sonoma winery map. Much of the Sonoma wine growing country is a series of valleys. Other vineyards are found on slopes and on high plateaus. As with Napa, the Pacific Ocean is a moderately influence on the climate, with fog and chilly periods being surprisingly good for grape growing. In the south part of the county (see the larger version of the map in a new window), the part that parallels the Napa Valley wine growing region, you find the districts of Sonoma Valley and Carneros, two of the most famous regions. In the northern end of the county are Alexander Valley and Knights Valley, both of which produce acclaimed wine. The other well-known area, Russian River Valley, is to the west. As you can imagine, that many regions and a size four times that of the Napa region means that there are a lot of Sonoma wineries. Here we show just a small piece of a larger map that shows many, many of the wineries. We think you'll agree that that's just too much information! That's why we distilled all this down to the eighteen Sonoma wineries you must visit! Be sure to read that article before you plan your winery visits. The Quick Access Wine Country Map covers both Sonoma and Napa wineries in a very thorough way. 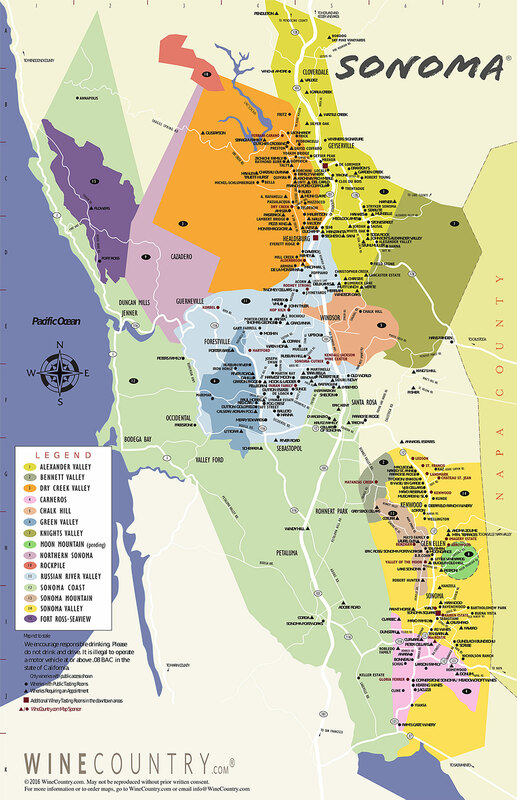 The laminated, accordion-fold map is durable and easy to use and also features, on the reverse side, visiting hours at the wineries, phone numbers and other useful information. As one satisfied purchaser put it, "This is unquestionably the best and most complete map of the Napa Valley and Sonoma wine areas I have EVER seen." We agree, and this is the one map we would carry with us.